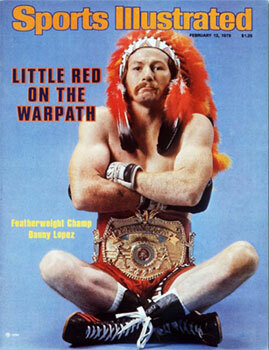 This weekend Philly Boxing History is heading up to the International Boxing Hall of Fame in Canastota, NY to celebrate the induction of Danny "Little Red" Lopez. Although no connection to Philadelphia, the former featherweight champion was one of our favorites back in the day, and is long overdue for the honor. Lopez was one of the most exciting fighters ever to put on the gloves. We also hope to see newly re-crowned cruiserweight champ Steve USS Cunningham in "Boxing's home town." Congratulations to Danny Lopez and the rest of the inductees. Philly Boxing History will be back to work on Monday.